Janet Brown Strafer is a retired Department of the Army Civilian with 35 years of federal service. She entered federal service as an education counselor for the Army in Berlin, Germany where she provided education and career counseling for soldiers in three infantry battalions. Following that assignment, Ms. Strafer returned to the United States and served as an Education Specialist and team leader of subject matter experts at the Army Engineer School where she wrote training extension courses and criterion referenced tests to evaluate Army general engineering skills. She then moved to the Pentagon, taking a position as a Management Analyst within the National Guard Bureau, followed by a job on the Army Staff in the Army Readiness and Mobilization Directorate within the Office of the Deputy Chief of Staff for Operations and Plans. There she wrote policies and procedures for reporting the combat readiness of Army units. Subsequent Pentagon assignments included Program Director for the Army Strategic Leader Development Program and senior leader education within the Army Strategy, Plans, and Policy Directorate. She set policy and guidelines for the program and negotiated agreements with participating prestigious academic institutions and notable think tanks in the United States and overseas. Following that position, Ms. Strafer was detailed to a special assignment in the Center for Land Warfare within the Office of the Assistant Vice Chief of Staff of the Army, serving as the Army's lead agent for tasks levied by the National Defense Panel during a Congressionally-mandated review and assessment of the structure of the armed forces to meet defense requirements of the post-Cold War era and the 21st century. That was followed by a return to the Strategy, Plans, and Policy Directorate where she was Branch Chief and Senior Policy Analyst in the Combating Weapons of Mass Destruction and Proliferation Policy Division. In this position, Ms. Strafer worked in the development of Army policy, oversight and assessment of Army implementation of Department of Defense guidelines for combating weapons of mass destruction. Concurrent with her work in civilian federal service, she served 22 years as a member of the Maryland Army National Guard with assignments as Assistant Readiness Officer, Special Assistant to the Chief of Staff and Army Master Fitness Trainer. 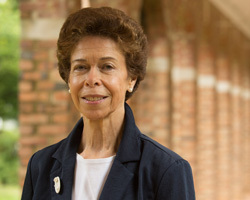 Prior to entering federal service, Ms. Strafer was a teacher and guidance counselor in the Williamsburg-James City County School System in Williamsburg, VA. She earned a Bachelor of Arts Degree in Elementary Education (1971) and a Master of Arts Degree in Education (1977) from William & Mary. Ms. Strafer is also a graduate of the United States Army War College; The Massachusetts Institute of Technology Seminar XXI – Foreign Politics, International Relations, The National Interest; and the Army Management Staff College.